I’m a bit of a wuss when it comes to fish and seafood. Generally, I do like fish dishes…but I become a bit more skeptical when it comes to fish stews and broths. If I order pho, ramen or wonton soup I become very picky about the broth. If it’s too fishy tasting, I won’t eat another bite. However, chowder is something I do like. When we took our summer vacation this past year to the Maritimes, I tried a few different clam and fish chowders. I remember a particularly good one at an Irish pub in Sydney, Nova Scotia. There were large chunks of white fish, salmon and clams along with potatoes, celery and corn and the broth was exceptional. Creamy and buttery without being too rich. It was the perfect bowlful. So when I found myself with some red snapper in the fridge, along with pretty red skinned potatoes, I knew that I’d try my hand at chowder. I had a tub of flavourful seafood stock in the freezer (tip: next time you make mussels, freeze the leftover liquid!) and some corn niblets that I had frozen myself in September. I wanted to lighten things up, so I used skim milk instead of cream and I just used a tablespoon of butter, but if you want something richer, then go all out and gild that lily! 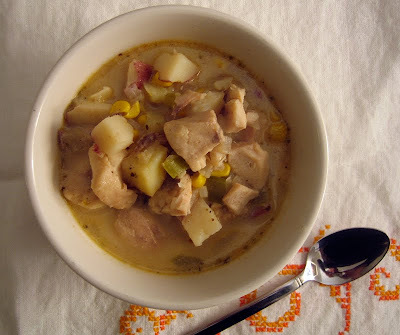 The final result was delicious and came very close to our dreamy Maritime chowder. In a large pot, saute the onion and celery in the butter until soft and fragrant. Add in the potatoes and all of the seasonings. Add in the fish stock and add enough water to just cover everything. Cover and simmer over medium heat for 30 minutes until the potatoes are done. Stir in the fish and cover again for another 15 minutes. Turn down the heat to a low simmer and slowly add in the milk – I had the heat on the very lowest setting. Do not bring this mixture to a boil or the milk may curdle. Add in the corn and let it rest with the lid on for 20 minutes, stirring occasionally. Serve in deep bowls with oyster crackers or hunks of buttered sourdough bread. Wow, thanks for sharing the recipe! Looks so yummy I shall have to try it right now. Growing up in a household that was Greek, I was exposed to all kinds of fish and seafood from a young age. I can even recall eating fish roe at the age of 6 and I was told that it was fish eggs! Your fish soup looks and sounds delicious and I definitely plan on making this as soon as I can get my hands on affordable fish in this expensive city! Mmmm… I think I'll most definitely buy some red snapper when we're at the coast & make this! Greetings from Maritime Canada, Campobello Island, NB. Here the fish of choice for Chowder is Haddock or Pollock in other Maritime location Cod would be use. (People here won't eat Cod) I doubt if you could find a dozen people in the Maritimes that have ever eaten Red Snapper. 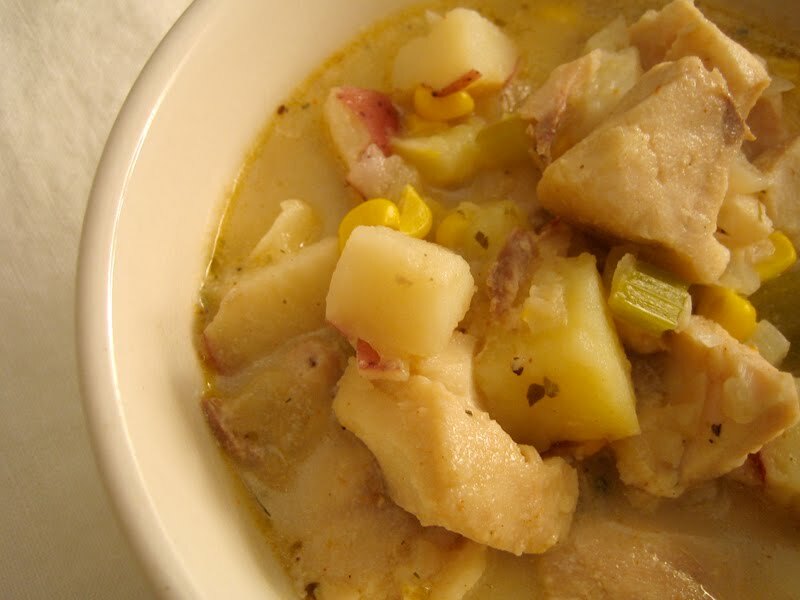 The local chowder here is very simple with few ingredients Onions and potatoes cooked in a minimal amount of water then add the fish for a few minutes once the fish is cooked we add Carnation Canned milk no cream and lots of butter and salt and pepper to taste. The canned milk believe it or not makes a creamier chowder than one made with cream. I am usually super picky about chowders and stews as well because I'm not such a fan of shelled seafood. And for some reason they tend to make things so much more fishy! This looks fantastic though. Creamy and delicious. 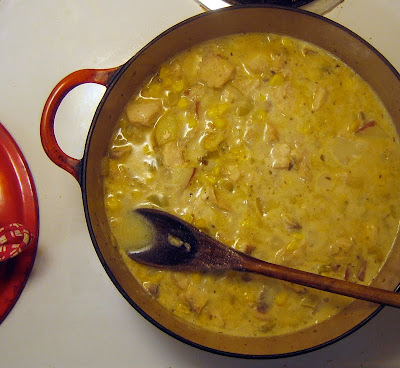 This looks SO tasty… I love chowders but have refrained from making them in the past, knowing that I can't resist the creamy goodness. This sounds like a flavorful lightened version. Here in Boston we loooove us some cod, so that will likely be the fish of choice. we love our chowder here in the pacific northwest! yours looks perfect for a cold, winter's night. This looks fantastic! Great idea on the fish stock; I generally freeze my shrimp shells to make stock with, but adding the mussel broth would give it an excellent extra oomph. I could go for a bowl of that right now! Yum. Merry Christmas! Thanks miss natty & tiffany! bijoux, i'm definitely thankful we live on the coast! good luck finding some good fish! Dale, thanks for all your notes and sharing your experience. It's true, Haddock was the fish of choice in NS when we were there. Not easy to find out here on this coast! Great tip about the canned milk. Thanks joanne, this isn't "fishy" at all. Just delicious. Lady Gouda, try this lightened version, it's a keeper. Elaine, great idea about the shrimp shells! Hag, hope you had a wonderful Christmas! Happy holidays to you too, Helene! Awesome tip, geek + nerd! Love it. Happy holidays to you! Howdy! I grew up in New England, so I know my around a chowder or two, yours looks delicious! Next time if you want to amp up the creaminess without adding the extra cream, take a cup or two of the potatoes and milk out of the chowder and give it a whir in the blender. It's really subtle, not enough to make the chowder thick. Merry Christmas! I think you forgot to mention adding the corn. This is simmering on the stove right now. I added scallops, and 1 1/2 c of corn by accident. Oops. I predict awesomeness! Thanks for the recipe. I made this with scallops and shrimp on Christmas Eve. Delicious! Lydia, thanks for your sharp eyes! I hope it was delicious. Talula, glad it turned out so well. I would imagine that with scallops, it would be incredible. My uncle has some Redfish egg sacks and wanted me to make chowder or of it. . . Do you think that would be good in this recipe?